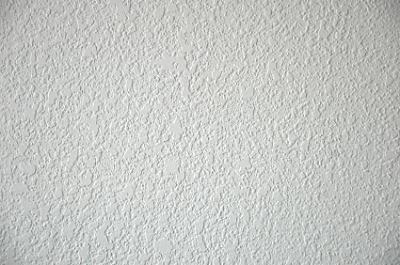 There are many good reasons to apply knockdown drywall texture. Aside from their ability to disguise uneven or poorly finished walls, heavy drywall textures can complement decorative paint effects, make a room seem warmer (as compared to a smooth, glossy finish), and even provide a moderate level of soundproofing. This technique has been popular for quite some time, and the only real drawback is that it can be difficult to recreate the texture on repairs. 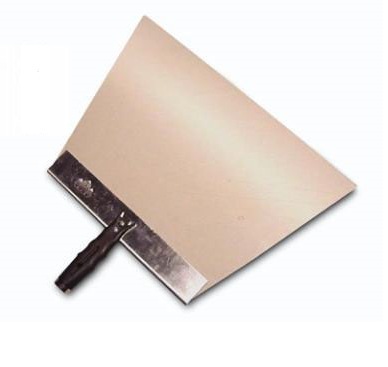 Knockdown texture, also known as skip trowel texture, is usually applied with a sprayer. The textured surface can also be created entirely by hand- it will just take a bit longer. As with many home improvement projects, surface preparation will probably take more time than the project itself. Damaged areas must be repaired and allowed to dry thoroughly before you can proceed. If your walls are in good condition, the only real preparation you’ll need to do is masking. Priming helps the wet texture dry more evenly, creating a more uniform pattern. Use a high quality latex primer and prime the entire wall. If the room has previously been painted and is in good condition, priming may not be necessary. Instead, use a fine sanding sponge to scuff up the paint and provide some “tooth” for the knockdown drywall texture to adhere to. Hint: Consider tinting your primer. This will allow you to see at a glance where the off-white compound has been applied, and whether you need to make a second pass to achieve total coverage. Powdered texture sold in bags is preferred by most contractors; it is, by far, the most economical choice. If you’re doing a small area (such as retexturing a repair), however, premix may be the better option. It comes in smaller sizes. One type of premix comes in an aerosol can and eliminates the need for a hopper gun. 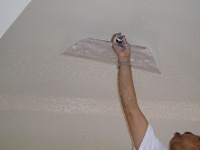 It provides acceptable results very quickly, but the spray cannot be easily adjusted to match existing texture. It’s also very expensive to do a large area. This type should only be used for small repairs in inconspicuous places, or where convenience is more important than an invisible repair (like in a garage or utility room). 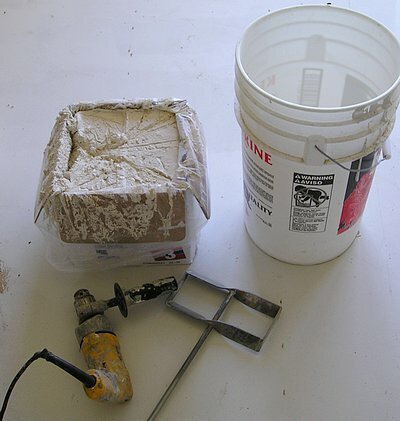 In a clean bucket, mix powdered texture compound with water according to package directions. For the best results, mix the day before use, then cover and allow to rest overnight. This will help dissolve any clumps and create a uniform, smooth product. Mix again right before use. Premix is typically too thick to use as-is. Thin it with water. Properly mixed compound will have the consistency of pancake batter if it’s to be used with a sprayer. If hand applying the texture with a crow’s foot brush, leave it a little thicker- about the consistency of a thick milkshake. Attach the hopper gun to the air compressor and fill the hopper. If you are not familiar with these tools, read the instruction booklet that came with the gun. If you’re renting, get instructions from someone at the store before leaving. Experiment with aperture size and pressure until you achieve a look you like; it may be helpful to do the first few passes on a scrap board until you get the hang of things. Low pressure won’t allow the compound to leave the gun; too high a setting will make the spray hard to control. Start with 25 lbs of pressure and work your way up. Keep the gun moving at all times. Horizontal, vertical, or diagonal strokes all work well; it’s strictly a matter of personal preference. Just make sure that you’re covering the wall evenly and not missing any spots. Patches can also be textured using a hopper. This is best for large patches. Use a circular spray pattern over and around the patch for best results. Two choices; use the brush to apply the texture or roll on the texture mud and stomp with the brush. Apply with the Brush: Dip the tip of a crow’s foot brush in texturing compound, then, holding it at a 90 degree angle to the wall, dab it on in a pouncing motion. It should form peaks. 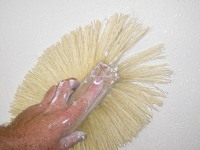 Wipe off the brush as it becomes saturated. Repeat across the surface. Apply with a Roller: You will need a 3/4 inch roller and extension pole to apply the texture mud. Roll on an even coat of texture mud and immediately stomp with the brush. Rotate the brush 1/4 turn after each stomp for a better pattern. This is best preformed by 2 people. Note: The thicker the drywall mud the taller the peaks will be when using a stomp texture brush. This will provide a heavier style of knockdown texture. Allow the texture compound to dry 20-30 minutes before knocking it down. It should be tacky to the touch. 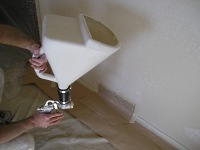 If you’re spraying on the texture, you may be able to spray the whole room before knocking down. If you’re using a brush, however, you’ll need to work in sections. Hold the trowel or at a 45 degree angle to the wall and flatten out the peaks. You want to cut them off, forming a plateau, rather than smear them. 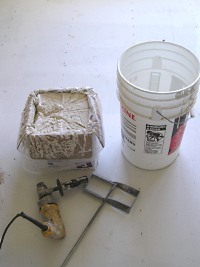 As mud accumulates on the knife, scrape it into the bucket to be reused. Allow the texture to dry completely before priming and painting. Most of time, you should allow 24 hours, but if the room is cool or humid, give it some extra time. Fans can help speed up the process. Some sites claim you can apply knockdown drywall texture with tinted mud and avoid painting altogether. Our advice is: DON’T. 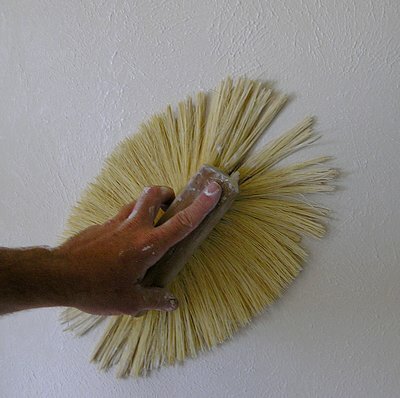 Priming and painting the surface will seal the texture from moisture, grease, and stains, which it readily absorbs. Plus, a painted surface just looks better.